In a resting state about 80% of the blood in our body resides in the gastro-intestinal tract. The remaining 20% circulates throughout the body to keep cells nourished with nutrients and oxygen. Under stress, the body’s flight or fight response sets in motion a series of physiological events to prepare the individual for physical survival. One of these events is the release of epinephrine and nor-epinephrine to increase blood pressure so that a shift in blood flow can occur from the gastro-intestinal tract to the large muscle groups in the arms and legs (for movement). This is all well and good if the person actually engages in movement (e.g., exercise), but it becomes problematic if one just sits there (these days, usually in front of a computer screen or in traffic). As the expression goes, pressure builds in a closed system. Without movement, blood pressure still increases, but without a significant shift in blood distribution to the arms and legs, pressure builds. Hypertension is a clinical terms to describe high resting blood pressure. Blood pressure is noted with two numbers: the first number (systolic) denotes the greatest force of blood through the left ventricle of the heart. The second number (diastolic) represents the relaxation phase of the heart. Debate continues over which number is most significant but ultimately a rise in both can be serious. Stress is closed associated with hypertension! Hypertension is often called the silent disease because there is no way to know if you have it unless you get it checked by a health care professional (e.g., nurse, physician, etc.). These days you can even get it checked at the grocery store. You can even get it checked when donating blood, which is always a good idea to do. Blood banks need blood and it’s an altruistic thing to do. Please consider giving blood today! Getting out and exercising isn’t a bad idea either. A lot of people are seeing their blood pressure rise with the fall of the economy and their 401K’s being reduced to 201k’s. One person who now makes his living charting various aspects of the economy is Chris Martenson. He has produced a series of on line videos with insights and suggestions about how to navigate the shoals of fiscal responsibility (and perhaps even lowering your blood pressure in the process). Here is his website. 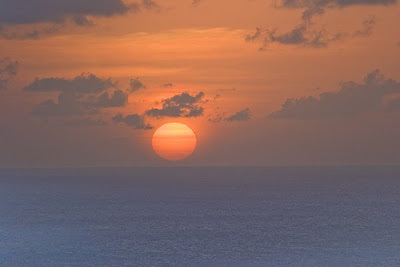 A sunrise photo from the Caribbean island of Canouan in the Grenadines (near St. Vinicent). Enjoy!